This distinctive log holder combines steel and beech wood, and can be set is two positions. Its curved shape makes a strong contemporary design statement. The Manoir is the updated version of Valcourt’s very first fireplace. Valcourt’s fireplace doors are second to none and the Manoir is another good example of their exception. The steel framed double doors with ceramic glass slide into each side of the fireplace, smoothly and easily; allowing for an exceptional view of the crackling flames. Thanks to the availability of two different styles of faceplates, this model will enable you to be creative with your décor. Moreover, you can benefit from the Manoir’s maximum heating output by using its optional blower and its two hot air distribution kits. 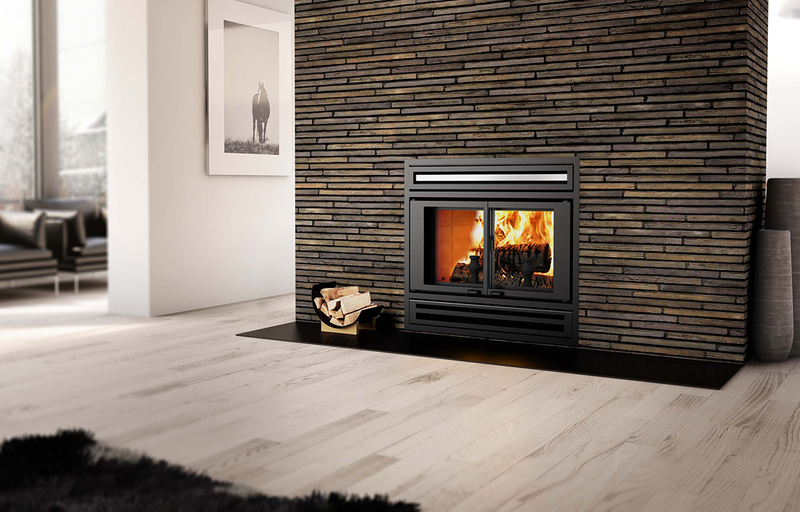 All Valcourt fireplaces feature a heavy duty construction for guaranteed peace of mind. A real solid luxury that will provide years of relaxation for you and your family. 100% of the last 2 homeowners who have registered their warranty are satisfied with this product. Glass surface – dimensions (Width X Height) 29" X 17 1/4"
Overall dimension (Height) 43 5/8"
Overall dimension (Width) 41 1/8"
Overall dimension (Depth) 27 3/8"
Door opening – dimension (Height) 17 7/8"
Door opening - dimension (Width) 30"
Firebox – dimension (Height) 18 5/8"
Firebox – dimension (Width) 23 3/8"
Firebox – dimension (Depth) 11 3/8"
Clearance – top (measured from the platform on which the appliance is installed)** 72" 72"
Clearance – combustible top mantle to unit 5 1/2" 5 1/2"